@Wei Huang asked me on Twitter whether, in the course of my messing about with automated kerning, I had compiled a table of the most common kern pairs. I replied that I hadn't but that it wouldn't be hard to do. So I did it. Based on a set of 514 fonts, here is a file with the top ten-thousand most common kern pairs and how many of those 514 fonts implement them. Could you also give some background information on what kind of fonts you were examining? Are these fonts from 514 different families? What stylistic characteristics do they have – sans, serif, script, blackletter, … ? Did you also include italics? How is your analysis dealing with class kerning? Does the size of the kerning value play a role too? One list I am really interested on is one of kerning pairs that never occur in the Latin alphabet, organised by language. Ramiro, you mean every possible combination that is not in use anywhere? Kern pairs such as "rX" and "pY"? There must be 100!s of these (using ! in its mathematical meaning as 'factorial'). Though count on things like RacerX brand and LeapYear Inc. to arise and make even those useful. @Theunis de Jong Nope, I mean kerning pairs combinations that makes sense. I don't kern lc/uc. I kern every possible combination of uc/uc, uc/lc, lc/lc, uc/sc, sc/sc. Of course some of these will never occur in any language. Therefore, I would like to know which these pairs are to avoid spending time on them and also to crop existing kerning tables. Ramiro — A couple years ago, I spent a few days compiling a massive word list from several Latin-using languages, using the corpora at the An Crúbadán project, and then writing a script to extract the most common words for every possible lc-lc (including a subset of Uc-lc where the pair is at the beginning of the word). I could probably run an analysis for which pairs are absent. It would be limited by my initial choice of languages to combine and by the limitations of the source corpora. If I find myself in the next few days looking for a distraction from work for a while, I'll see what I can come up with. How useful is that sort of statistics in practice? It gives a hint on the most common instances regarding ‘normal’ typefaces, sure. Hence it says very little about equally neccessary cases like f” f] (j – and so on. But the choice of pairings is also dependent of the specific design of a typeface, e.g. if it is a blackletter or scriptish design or otherwise different from mainstream models. I was always more interested in a systematic approach towards the generally most important pairings, as well as for a practical overview on language-specific pairings which are not that much obvious at first-hand for most of us (e.g. f_ð). I've long thought that a more flexible approach to sidebearings--something beyond simple advance widths that takes into account glyph shape--would eliminate most of the need for kerning pairs, and even allow automatic spacing between different styles and fonts, or even different sizes of the same font/style. There have been some tools on the developer side that let the type designer work as if this were the case, but in the end you still need to generate kerning pairs in the finished font since that's all the font formats support. Ideally, something like this could be incorporated into the font spec, eliminating the need to worry about wasting time on kerning combinations that will never arise in actual use. Fonts would, in effect, be self-kerning. Anyway, sorry to go off-topic. @Mark Simonson However (and this is veering even more off-topic...) automating/detaching spacing from the letterforms implies a favoring of the black over notan. We spend so much time tweaking the black to within 1/1000 or finer, but when it comes to the white (at least the whites between glyphs) we settle for things like ±5/1000 or even ignore may pairs. Sure it's an expediency, but at the very least we need to admit the flaw. And ideally, if we do automate the inter-glyph white, it needs to depend on more than the black's lateral profiles. Are these fonts from 514 different families? What stylistic characteristics do they have – sans, serif, script, blackletter, … ? Did you also include italics? These are computed kern values between the pair - the value you would send to a layout engine. So after class kerns have been "decomposed". Nope, anything non-zero is in there. Ramiro — I don’t know what value these lists will actually have, from a practical standpoint; but I went ahead and ran an analysis last night. As mentioned, my master word list was compiled from An Crúbadán corpora. Since those corpora were basically scraped from the internet, there’s a lot of flotsam in there. When originally compiling my list, I did some broad work to remove acronyms and such. But there’s no accounting for misspellings, etc. It’s not a carefully curated set. 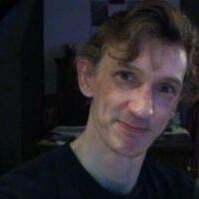 The languages that I combined were English, German, French, Italian, Spanish, Portuguese, Dutch, Danish, Swedish, Finnish, Norwegian, Estonian, Polish, Czech, Slovak, Albanian, Hungarian, Turkish, Lithuanian, Romanian, Latvian, Maltese, Northern Sami, Welsh. The goal was to have a representative for all the extended latin characters in my typical char set. My combined list consists of 951,208 words. Using a character set gleaned from the word list itself — abcdefghijklmnopqrstuvwxyzàáâãäāăąåæçćčċðďđèéêěëēėęğġģħìíîïīįıķĺļľłńňñņŋòóôõöőøŕřśšşșßțťŧþùúûüūůűųŵẁỳýŷÿźžż — yields 11,449 possible combinations. Out of those combinations, 7917 pairs had no occurrence in the word list. Checking against initial position only, that list increases to 9200 non-occurring UC-lc pairs. The vast majority of these are combinations of two accented letters that don’t occur in the same language (out of those surveyed). There may be some false positives here. For instance, I saw some basic ß-combinations in the results for which folks came up with rare examples in another thread here, but which must not have occurred in the corpora I used. So, like I said, I’m not sure what practical use this has. But here you go anyway. Would you not also want your kerning to work for acronyms, business names, product names etc? Some languages merge compounds and form letter pairs not found in any dictionary. Some languages stick lowercase letters to the left of capitals. IMHO, you shouldn't kern everything (and I kern a lot). Some situations like brands, etc; are best left to the type setters or designers. I’ve recently tried to approach this slightly less specific/detailed, yet broader reaching, by making generalised groups of shapes. For example, in my next release the left-hand side of all accented lowercase a’s are grouped as “a_accent”. I omit the á and others that do not interfere too much with the whitespace top left. Tä Tà in “a_accented” — Ta Tá in “a”. A few years back I started adopting the same approach as Frode as far as how I group kern shapes for kern classes. Where we differ is that I kern lc-to-cap combinations, and nearly everything. I have also come in recent years to feel that for oddball glyphs that “sort of almost fit” but not perfectly, in a class, but wouldn't be worth kerning on their own.... Well, as long as it does not cause over-tight kerning of those glyphs, it is better to lump them in a class and give them imperfect kerning, than to leave them unkerned. Oh, I kern lc-to-cap. And do my best to solve the problematic ones with drawing and spacing before kerning. Indeed. 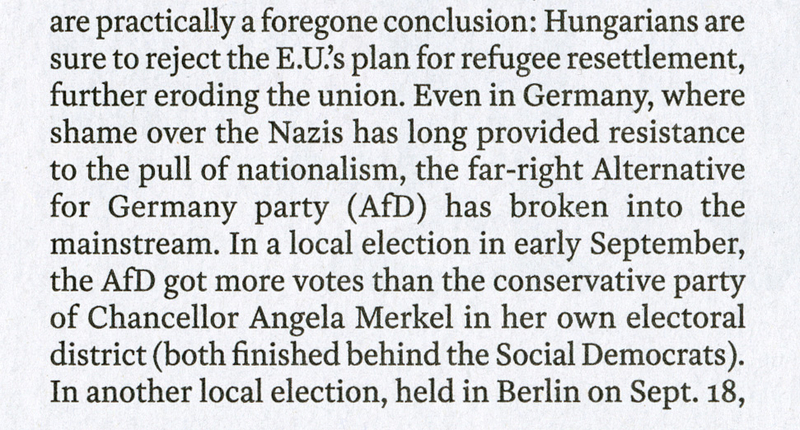 Before the recent rise of the far-right in Germany, I would not have thought I needed to consider the “fD” combination. I definitely took notice when the following showed up in my mailbox in a Sept 2016 issue of TIME magazine. I was somewhat relieved to see that the combination did not crash horribly in the fonts that I designed for them. I’m not sure that a kern pair would have improved things much, anyway, but it certainly put this combination on my radar. I once toyed with the idea of using different lookup types to create a “cascading” kern feature, where accents might be handled as additive kern adjustments instead of enumerated exceptions. So, for example, the final rendered adjustment for Tà would be -90+40 = -50. It always seemed like a promising idea, but I never took the time to try to develop a tool for managing, a format for storing, and a routine for generating or compiling the feature. There's even a country name with an intercap now (although rarely requiring a kern). I like your idea a lot! Should be `A V`. Can you run it through the kerning table instead?